A Discovery Street tour is a one-of-a-kind experience of San Francisco. Get your hands on the science of everyday life and stroll hidden alleyways and breathtaking vistas with other folks like yourself—curious, active, and a little beyond the ordinary. What tours do we offer? 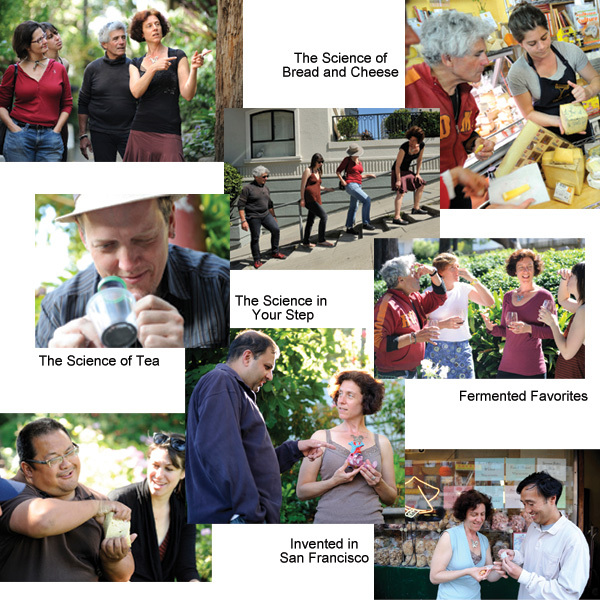 Explorations of the science of cheese, wine, geology, invention, and walking! Check out our tours page for details and upcoming dates. We also do private tours for teambuilding events, weddings, birthdays, family gatherings, alumni associations and just plain celebrating friendships. Call us at 415-663-6768 or email robin@DiscoveryStreetTours.com to book a tour. We also do several public tours per month. Join our mailing list and be the first to hear about them!